It's time to illuminate your deck and show off your yard as the best in the neighborhood! Entice your neighbors to visit, throw a festive party, and create a lively mood for fun and entertaining with outdoor patio lights! 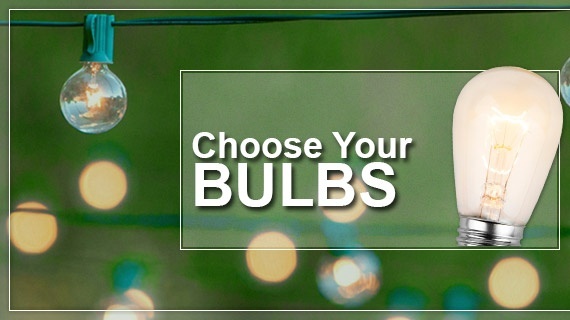 Choose your stringer to create custom spaced patio lights for your deck and lawn. Need help understanding all the size classifications? C7/E12 sockets are candelabra size. They are great in smaller spaces and can be used in a variety of ways for both string lighting and decorative lighting. C9/E17 sockets are a step larger than their C7/E12 cousins, with an intermediate socket base. 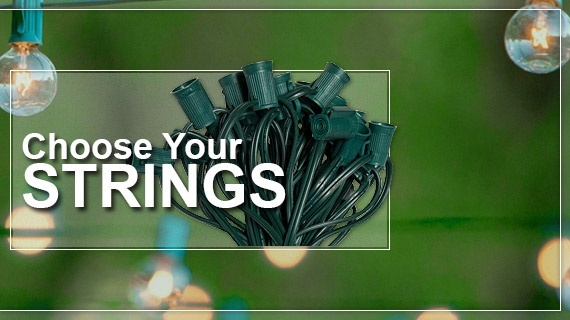 C9s are a great choice for patio string lights, decorating larger areas and for getting more illumination. E26 sockets seat regular household bases, allowing for larger bulbs and patio lights that you might want spaced further apart, or for large areas where you want a larger light display. Now just add clear or colored lights bulbs and turn on the fun!